Cooked carrots hold no appeal for me, so when I heard about this recipe, it made quite an impact since heating a carrot in any way, shape or form results in a curled lip of disgust on this face. Attraction number one was my curiousity about the fritter itself having never eaten one much less made one. The second attraction was that I had found five unharvested carrots when cleaning out the garden last year and thought I should honor them with a new culinary venture. So fritters it was! 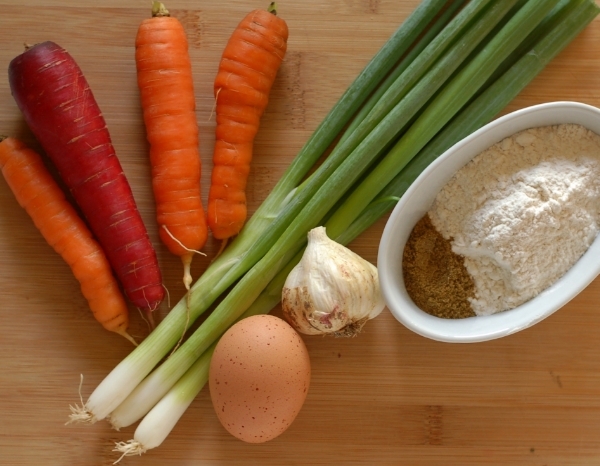 Stir together the grated carrots, chopped green onions and garlic, cumin and salt together in a large bowl. Add the beaten egg, flour and Panko to the bowl and mix to combine thoroughly. Add the vegetable oil to a large frying pan and turn to high. Form patties with your hands until they are the size of your palm and place in pan. Flatten with your spatula to about 1/2" thickness. Cook for 2 minutes on each side until golden brown. Transfer to a paper lined tray and put in a low temp oven to keep warm while you cook the next batch. Yields approximately 6 patties. My alterations to this recipe included the addition of cumin as well as replacing half of the flour with Panko which not only added texture but aided in the browning.